Cakes & More: Instant Microwave Brownie - Eggless, Warm and Chocolaty - Just 2 Minutes!! 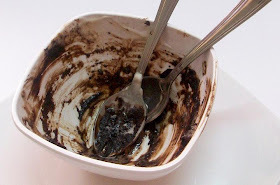 Instant Microwave Brownie - Eggless, Warm and Chocolaty - Just 2 Minutes!! My old basic model microwave conked at last! .YAAAAYYY!!!!! How I had been waiting for this joyous day!! Am so so happy to finally replace it with a bigger convection model:-))). My old microwave which had been my kitchen companion since years conked:-((.. sighhh... And hubby had to get me another one offered to buy me another one. I now have a big 30 liter convection microwave which occupies a ( good lot of) place of pride on my tiny kitchen counter in my even tiny kitchen. A peek into the new microwave makes me feel like I am looking into a HUGE baking chamber no less! Oh joy!! It can fit a good number of my bigger baking tins. Much to the amusement and bewilderment of the electronics store guy, I had carried my big baking tins to see if they will fit in the oven. Oh well, its a very big decision and an even more important gadget in the kitchen and I wanted to do all possible to ensure I made a decent choice. 3 visits (these are few considering that I can be extremely indecisive when it comes to buying most things) to the store, some internet searching and some mails to blogger friends and the microwave was on the counter. And yes, I very much have my loved small 14 liter Morphy Richards OTG which introduced me to the pleasure of baking. There are so many microwave recipes I have been wanting to try, but could not due to the growing inefficiency of the old gadget. One of the recipes being Instant Microwave Brownie which will take 1.5 minutes to get cooked and 3 minutes to put together. Forget the pictures here which I took in a hurry - this tastes good!! Mind you, I am not very much of a believer in these recipes, had tried a similar one sometime ago and it was a put off. But I liked this instant version from Art Of Dessert and I must share this with you. 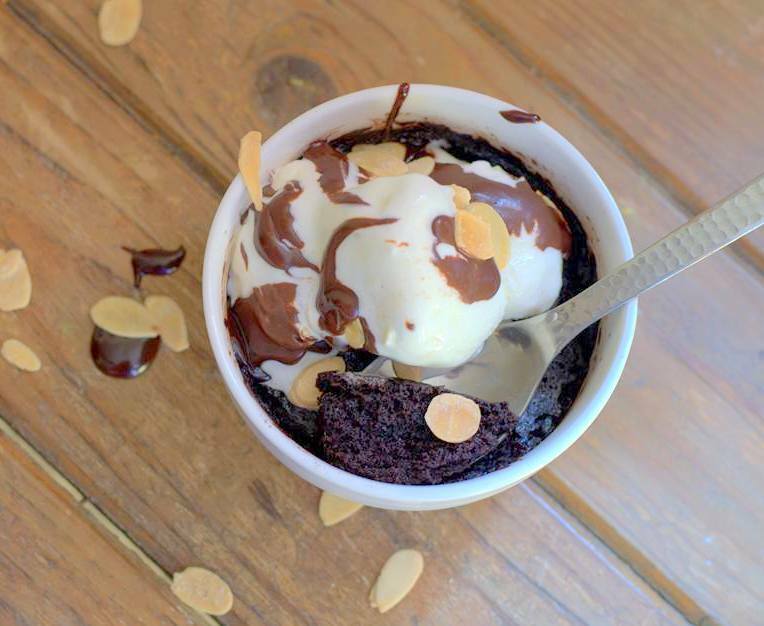 This will help you give a good brownie to your chocolate hungry kids in a flash, will see you through your dessert craving on a long tiring day and still leave you pretty satisfied. Sounds good eh? And with Valentine's Day around the corner, this serves-2 dessert is a good one to make for a cozy two-some - particularly if you are not a hands-on person in the kitchen. If you love your brownie warm and gooey but iffy about uncooked batter with eggs, you are in luck as this one is egg-free too! As Rianne says, you could mix up the dry ingredients and store in a zip-lock bag, just mix in the wet ingredients and zap in the microwave.. and you are good to go! Aren't these enough reasons to give a try at this? Recipe from the very spirited Rianne's beautiful blog, Art Of Dessert. Do check her space for many more eggless recipes, recipes meant for people with allergies, cake decorating and so much more. Unsalted Butter, melted - 1 1/2 tablespoons (original recipe has 2 tbspns) Please read important note below. Procedure: In a small microwave safe bowl, mix the melted butter, milk and vanilla extract. Combine the rest of the dry ingredients in another bowl and add to to the wet ingredients. The batter will be of a dropping consistency. Microwave on HIGH for 1.5 to 2 minutes. Mine is 900 watts at full powder(ahem!!). And also the cooking time depends on the voltage too in our country (sigh!!). Check at 1.5 minutes. The top should look dry and not show any uncooked batter. If it does show uncooked batter, microwave for another 30 seconds. Its OK if the top feels very soft when touched(as long as it looks dry), it will harden slightly when you allow it to stand. Yep, have made this a few times in my old microwave and figured this out. If you over cook, the brownie will become tough. Allow the brownie a standing time of about a minute in the microwave. Take it out and allow to cool for a couple of minutes. 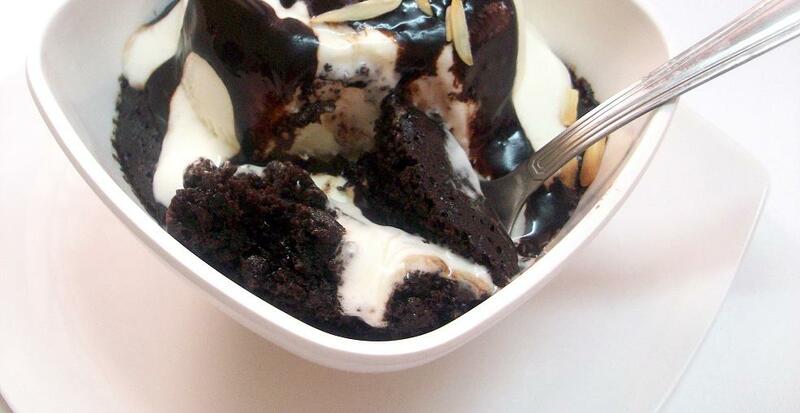 Top with a scoop of vanilla ice cream and some chocolate sauce and toasted nuts if you like. I have topped with Low Fat Ganache. OK, I got carried away and put too much of it!! Serve immediately! Note: Keep the butter out on the counter first before you measure out the other ingredients. The butter must be really soft. Melt it gently on low heat. I have observed that if this not done, the butter sometimes tends to float on top. The quantities of butter and sugar I have used make this just sweet and not very rich. And do remember that the sauce topping will make the dessert sweeter. Thanks Rianne for this delicious chocolate delight! I had to take pictures of the empty bowl as you did, just to tell you that we thoroughly enjoyed the treat... while we fought for the last spoon and lick!! This brownie is on its way to Ally's Event with a delicious dessert book as the giveaway! The brownie is being sent off to Divya's 3rd Blog Anniversary Event! Bookmarking this ..Thanks for sharing the recipe ! I could really understand the joy u must have felt when ur old one gave up, the new entry into the kitchen is alway joyous, I am also a proud owner of a 45l microwave and it does occupy a huge place in my kitchen. This brownie looks so good and surely a keeper. That certainly looks yummy. I make a vegan version of this which is (I guess) a lot less rich but also lower in cholesterol and fat. the sauce is a great finishing touch. wow this so awesome and tempting! very yummy too! Mmmmmmmmmm that looks absolutely yumm.. Awesome.. seriously tempted. which model did u go for????? New entry into the kitchen is always wonderful, brownies looks absolutely inviting and definitely a delicious and quick dessert to enjoy..looks super delicious..
WoW! Congrats Suma on ur new acquisition! 30 lt MW with convection surely calls for this treat! I attempted at MW cakes the last time and they turned out rock hard! What would you expect at a MW time of 5 mins ;) Your looks fabulous and an instant dessert at disposal for unexpected guests. Yum Yum! Bloghopped over and tried this brownie, and it turned out yum! Thanks so much sharing. Looks delicious...got to try this!!Yummy!! i am keeping this recipe in mind as I have always wanted to make a brownie in the microwave (and my daughter would adore it too). my the brownie is a winner!! Hi Suma..Lovely recipe I must tell..so tempting infact this is my first visit to ur blog, saw this recipe and knew I had to try it instantaneously.I ve made it and we (me n my hubby) have devoured it as well.it was fabb !! infact I was looking for an instant brownie recipe ! This will easily qualify as the quickest recipe tried by me after bookmarking it.Thanks a ton n u ve got a regular follower..
hi...great photo and great recipe..must try this.. I just have one question.. is there no baking powder at all in this recipe? or am i missing something? @pb- Nope, there is no baking powder in here..
Made em just now! :D . And booooooooy did they turn out great!! Am happy that atleast this turned out great! :D .
One word to say "wow" ...my Kids really enjoyed yummy delicious brownie...just wanted to know can weat crease the measurements 4 times to it and bake in MW within same time? This looks so yumm.. One question, the sugar u mentioned is it powdered or granulated? I' m new to baking. So confused? i have tried several instant cakes, but none of them gave me as much results as this one. it is soft, spongy and perfectly baked. thank you for sharing the recipe. Thank you for visiting Cakes and More! I would love to hear your thoughts and comments on this post!